NOW WEEKLY! Fair Foods' $2-a-bag program thrives in Mission Hill! Fair Foods brings its $2 a bag program to Mission Hill at the Tobin Community Center every Wednesday from 4:30-5:30 pm. This program is opened to everyone. Feet First Walking Group Finished for 2018; Look for it in Spring 2019! ​Every Thursday at 10 am. walkers start out from the MHHM office, rain or shine, at 1534 Tremont Street. Routes vary but all levels of walking ability are accommodated, from the newbie to the high speed competitor. Keep exercising this winter at the Tobin Community Center which now has cardio equipment such as stationary bikes and treadmills. Membership is very affordable. Ms. Massachusetts Exquisite International, Connie Kirven. 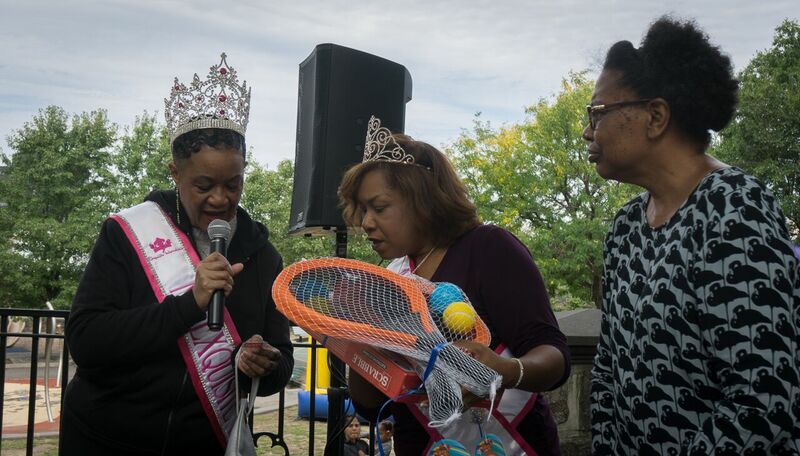 and Sondra Hardy, the pageant’s Lifetime Queen assist in handing out the raffle prizes at the Health and Wellness Fair. Pony rides at the Health and Wellness Fair excite child attendees!